I love this image of Ronnie Raymond as Firestorm with Ray Palmer as the Atom! This comes from JLA #69 (Oct. 2002) by Yvel Guichet and Mark Propst. 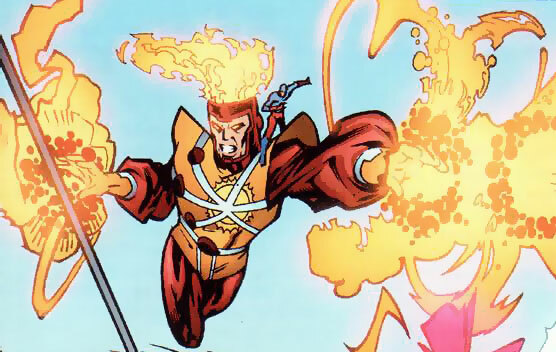 This art comes from a time when Ronnie was operating solo as Firestorm. Also during this era, Ray Palmer was mentoring Ronnie in science to aid him with his atomic restructuring powers. Given the circumstances, Ray Palmer made a great stand-in for Professor Martin Stein. Finally, if you’re a fan of The Atom be sure to check out the Power of the Atom blog run by our good buddy Diabolu Frank! It’s a fun site dedicated to The Atom and Captain Atom! Support Firestorm (and Ray Palmer)! Fan the flame! Posted in: Firestorm #05: Ron solo, Justice League of America, Ronnie Raymond. Honestly, for Ray, I would just be happy to see Geoff Johns do a treatment for the character… I guess Ryan Choi could tag along too (since DC appears to love the character again)…. It just seems Geoff has a way of taking heroes that are lagging in sales or have always had trouble (like Aquaman (aside from Peter David’s run)) and he some how makes them hits!! Firestorm is a tough character to partner up with, and the Atom kind of works in that respect. I think Ray joining the Firestorm Matrix might be a cool trick as a one-off event in a team book, but I don’t feel like it would hold interest in a long form team-up. It’s like when shrinking heroes ride on a fired arrow toward a target. The first time Hawkeye and Ant Man did it, or that one time Connor Hawke fired Atom at Darkseid– very cool. If the same thing occurred within six months, folks would forget the first cool event and just groan from the repetition. I do wish, especially in light of the New 52 First Wave cancellation, that DC tried more combo titles. That said, The Atom & Hawkman died pretty quick, and the only example I can think of that really panned out was Power Man & Iron Fist. Christopher Priest once proposed combining Steel with Guy Gardner: Warrior, which would have been awesome, but DC didn’t bite. What I think DC really needs, and has for decades, is a second Justice League type team for popular, compatible former members. They keep trying to do that with JLI, but they work best funny and under Giffen/DeMatteis/Maguire. I mean mainstays like the Atom and Firestorm, who can hold up to creative team changes and engage in more straightforwards heroics. @DrNobody – I gotta assume someone will take up Ray Palmer sooner or later in the New 52. His character has lots of potential. It just needs a good writer. @Frank – Combo titles? BLACK & BLUE, Frank! Get on board! In all seriousness, I was envisioning Ray and Ronnie being merged quite often. The going solo adventures of the Atom would be the more rare occurrences. Either way, this whole thing is the pipe-dream of one deranged fanboy. @Keith – If memory serves, during Joe Kelly’s JLA run, Ronnie was caught talking to himself and even saying “we”. I’ve always wondered if Joe planned to reveal that Ronnie was already merged with someone and we just didn’t know it. An imaginative idea, sir, but I’m with Frank. A one-off story would have been cool, but long-term? No thanks. Each of these atomic heroes is interesting enough that they shouldn’t have to share the spotlight this way. Team ups yes, but a shared body would be a disservice to them.